+1 If I had the cash to buy a Hellcat, I'd wait for the new GT350. If I had a little less cash, I'd buy a 2015 GT and mod it up a bit. A little less cash, and I'd buy a 2015 GT, and leave it stock, but still have a sh*t-eating grin on my face for a few months. What keeps me from wanting to buy another Termi down the road is that I just didn't fit all that well in it. I fit much better in the S197, and I would imagine anything newer would be the same. BUT, I still have my Notch sitting in the garage, and now that I've been working on it again (installed an alarm with keyless entry and wired to the horn instead of an annoying siren, and have been fixing the stereo) it's been making the want to sell it fade. I'll continue working to get rid of a couple nagging issues (a squeak in the left rear suspension, occasional scrape of the parking brake bracket against the d/s, and paint imperfections), and see where I am once I have it at a place I feel is good enough to sell. SonicVenum wrote: What keeps me from wanting to buy another Termi down the road is that I just didn't fit all that well in it. I fit much better in the S197, and I would imagine anything newer would be the same. BUT, I still have my Notch sitting in the garage, and now that I've been working on it again (installed an alarm with keyless entry and wired to the horn instead of an annoying siren, and have been fixing the stereo) it's been making the want to sell it fade. I'll continue working to get rid of a couple nagging issues (a squeak in the left rear suspension, occasional scrape of the parking brake bracket against the d/s, and paint imperfections), and see where I am once I have it at a place I feel is good enough to sell. 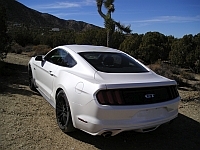 Considering that I might be in market for a car, I should ride in a modern Mustang. If you are comfortable in it, I should REALLY be comfy. A little birdie told me a while back, couldn't believe it. Don't pour Salt in a still fresh, open wound! Brakelate wrote: Don't pour Salt in a still fresh, open wound! Glad to oblige, since misery loves company. As for the new Mustangs being more comfortable than the older ones? This is definitely true and, other than a bit of initial difficulty getting into my 2012, due to my bad hip, it is not cramped at all once behind the wheel. In fact, with the auto trans and the cloth interior, it feels like a slow Buick sedan, or a Camary, or some such vehicle.